Marine animals like this southern right whale are being hammered with noise pollution and it’s only going to get worse. The sea is lovely, dark and deep — but it’s not quiet. In recent decades, the explosive growth of manmade noise from ships, sonar activity and oil drilling has created a new class of worries for marine animals and the scientists who study them. In the United States, researchers and activists are renewing a long-stated concern that the noise from oil exploration may be too much to bear for the last remaining North Atlantic right whales. 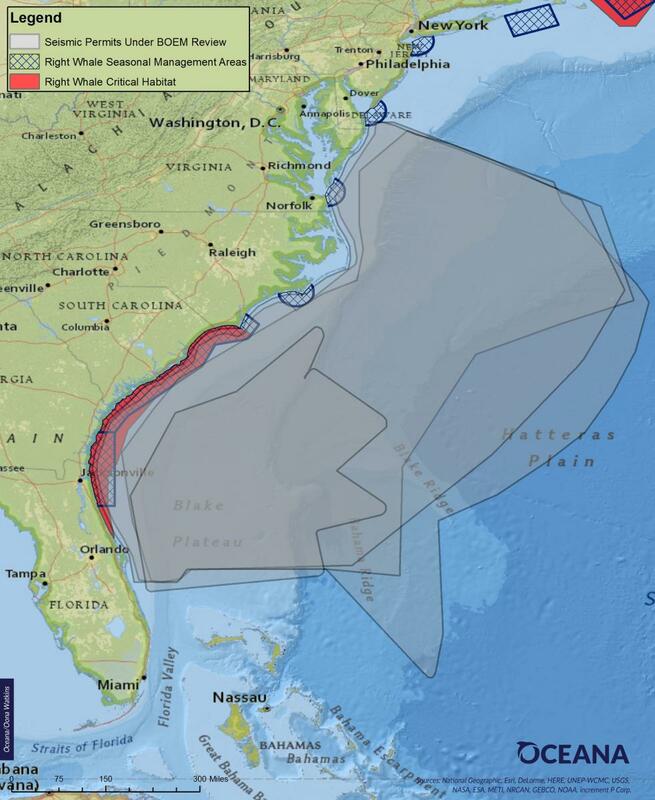 In a few months, the U.S. Atlantic coast may get another layer in its cacophony of ocean noise: the dynamite-like blasts of seismic airguns, which are used to search for oil and gas deposits buried beneath the seabed. In April, 28 right whale scientists warned President Obama that seismic airgun blasting will come at a high cost to whales’ ability to eat, rest, communicate and reproduce. With only 500 North Atlantic right whales (Eubalaena glacialis) left alive, this may “substantially increase” the risk of extinction. Ships can tow dozens of seismic airguns behind them during a survey, each airgun emitting bursts of sound every 10 to 12 seconds, up to 24 hours a day. These surveys can last anywhere from days to months. While the Obama administration put the East Coast off-limits to oil and gas drilling until 2022, seismic airgun blasting has not yet been shelved. The government could approve permits for seismic airgun blasting in the Atlantic as early as this summer. And oil companies could deploy these devices immediately after receiving approval, said Ingrid Biedron, Ph.D., a marine scientist at Oceana. Like people, right whales are a talkative lot. And, like us, right whales need to hear and be heard. Their most common vocalization, the lilting up-call, is the cetacean equivalent of saying “I’m over here.” These calls are so common, in fact, that a series of buoys equipped with microphones north of Cape Cod listen for up-calls to alert ships when right whales are nearby. Females likely use these calls to alert males when they’re in a romantic mood, or to summon wandering calves back to safety. Areas under consideration for seismic airgun blasting overlap with the only known calving ground for this species. Sound may play other, more exotic roles in right whale life. Scientists still need to confirm these ideas, Biedron cautions. But some researchers think that right whales can listen for the different sounds that come from land and use it to navigate. Others suspect that North Atlantic right whales may use a variation of their up-call to tell neighbors when they find plankton — an altruistic strategy that animals could adopt when food is abundant but unpredictably distributed. However, the deep rumble of ships or the blasts of seismic airguns can drown out these calls. Government and industry officials have taken steps to cut down on underwater noise pollution, including developing new alternatives to seismic airguns, “quieting” ship engines, and considering regulations that limit the volume from commercial ships. But current efforts aren’t enough.